Alopecia (the medical term for hair loss) sufferers spend a whopping 3.5 billion dollars a year on products to attempt to regrow their hair. Unfortunately, 99% of these products are completely ineffective for the majority of patients. This is because successful treatment of hair loss is dependent on understanding why it is occurring. Accurate diagnosis of the root cause of alopecia is based on history, physical examination, and in some cases bloodwork or scalp biopsy. Broadly, alopecia can be classified as scarring or non-scarring. Scarring alopecia comprises 3% of hair loss cases and can be more difficult to treat, depending on the degree of scarring present. It is defined by destruction of hair follicles and their replacement with scar tissue. The cause of scarring may be inflammation due to a primary disease process or traumatic hair loss practices. Non-scarring hair loss is far more common. It includes androgenic alopecia, alopecia areata, and telogen effluvium. Diseases such as lichenplanopilaris, folliculitis decalvans, discoid lupus, and dissecting cellulitis may cause scarring alopecia. Hair care practices such as tight braids, weaves, twists, hot comb use, and relaxer treatments can traumatize roots over time and lead to hair loss along the hair line (traction alopecia) and/ or at the top of the scalp (central centrifugal cicatricial alopecia). All types of scarring hair loss require prompt diagnosis and treatment by a dermatologist to decrease the risk of permanent, irreversible hair loss. Treatment may include systemic medications for underlying skin diseases, intralesional injection of steroids, topical minoxidil or, in severe cases, tattooing or hair transplantation. Any traumatic hair loss practices should be minimized or altogether discontinued. The most common non-scarring alopecia is androgenic. Androgenic hair loss is usually inherited and presents with gradual thinning of hair with age. It is so commonly seen in both men and women that it is sometimes considered a normal variant. Treatment includes topical minoxidil and oral medications such as spironolactone or finasteride. More recently, PRP (platelet rich plasma) injections have been used to stimulate regrowth. In the right candidate, hair transplantation may be an option. Alopecia areata is autoimmune mediated, meaning that the body’s inflammatory cells attack the hair follicles. Hair falls out in circles and, in most cases, regrows over time. Mild cases of alopecia areata are ideally treated with cortisone injections into the scalp. More severe cases can be widespread and generally require topical immunomodulators, light therapy, or systemic treatment. 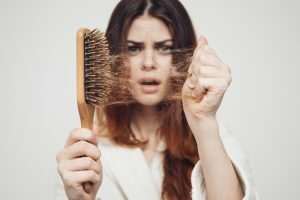 Telogen Effluvium is a sudden, rapid hair loss that usually occurs 2-3 months after a stressor – pregnancy, change in medications, hospitalization, surgery, weight loss, or extreme stress. Basically, the body attempts to preserve resources and pushes hair roots into the resting phase. Up to 70% of hairs can be shed in a short time. Generally, recovery occurs spontaneously within 6 months and no treatment is necessary. Hair loss can be triggered by an underlying diagnosis or can be genetic in nature. It is important to treat early on in order to prevent progression. Even in late stage hair loss, intervention can often lead to a significant improvement in appearance.